Fares are the lowest currently loaded for selected travel dates. Availability may vary and some fares may only be bookable as part of a British Airways Holidays package. Advertised sale prices discounted from lowest price available in the 14 days before 06 March 2019. Lower prices may have been available for indirect flights on certain routes. Prices include all taxes, fees and carrier charges, correct as of 07 March 2019. All Longhaul prices quoted are for return travel. All European prices quoted are each way based on a return journey. All prices valid from London Heathrow, London Gatwick and London City Airports. 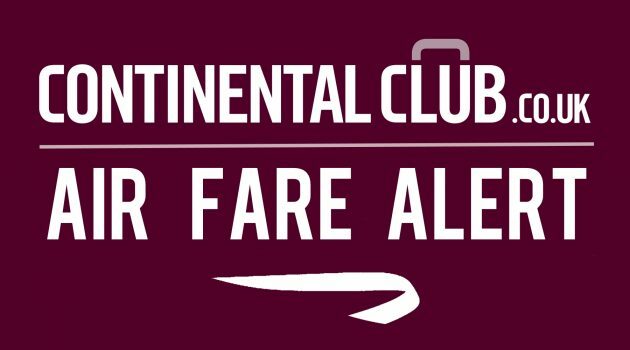 Flights to all destinations must be booked between 12:00 GMT 07 Mar 2019 and 23:59 GMT 26 March 2019.
a) Travel in First from London Heathrow to Doha, Santiago, Sao Paolo, and Tokyo, for selected outbound travel dates between 04 April 2019 and 31 January 2020.
b) Travel in Club World from London Heathrow to Abu Dhabi, Amman, Bangkok, Bahrain, Beijing, Beirut, Bengaluru, Buenos Aires, Cape Town, Chennai, Delhi, Doha, Dubai, Durban, Grand Cayman, Hong Kong, Hyderabad, Johannesburg, Kuala Lumpur, Mumbai, Nashville, Nassau, Nairobi, New York , Osaka, Rio De Janeiro, Sao Paolo, Santiago, Seoul, Seychelles, Shanghai, Singapore, Sydney, Tel Aviv, Tokyo, and Vancouver, for selected outbound travel dates between 11 March 2019 and 01 April 2020.
c) Travel in Club World from London Gatwick to Cancun, Fort Lauderdale, Lima, Mauritius, Orlando and Tampa, for selected outbound travel dates between 28 April 2019 and 02 March 2020.
d) Travel in Club Europe from London Heathrow to Amsterdam, Berlin, Bucharest, Stockholm, Athens, Barcelona, Belfast, Billund, Bologna, Brussels, Basel, Budapest, Paris, Copenhagen, Dublin, Dusseldorf, Edinburgh, Faro, Rome, Frankfurt, Gibraltar, Glasgow, Gothenburg, Geneva, Hanover, Hamburg, Helsinki, Ibiza, Inverness, Kiev, Keflavik, Krakow, Leeds/Bradford, Larnaca, St Petersburg, Lisbon, Luxembourg, Lyon, Malaga, Madrid, Manchester, Marseille, Munich, Nice, Newcastle, Nantes, Oslo, Palma, Prague, Pisa, Sofia, Stuttgart, Toulouse, Valencia, Vienna, Warsaw and Zurich, for selected outbound travel dates between 07 March 2019 and 30 November 2019.
e) Travel in Club Europe from London Gatwick to Almeria, Amsterdam, Bilbao, Bordeaux, Cagliari, Jersey, Nice, Venice and Verona, for selected outbound travel dates between 29 April 2019 and 30 June 2019.
f) Travel in Club Europe from London City to Amsterdam, Berlin, Dublin, Dusseldorf, Faro, Frankfurt, Geneva, Ibiza, Malaga, Mikonos, Munich, Nice, Palma, Paris Orly, Prague, Rome, Santorini, Zurich, for selected outbound travel dates between 24 April 2019 and 30 November 2019.
g) Prices may vary based on the dates selected for outbound and inbound flights as part of a return journey. a) For all travel in First on the following routes, a Saturday night stay is required – London Heathrow to Doha, Sao Paolo, Santiago and Tokyo. b) For all travel in Club World on the following routes, a Saturday night stay is required – London Heathrow to Bangkok, Buenos Aires, Cape Town, Doha, Durban, Grand Cayman, Johannesburg, Kuala Lumpur, Nairobi, Nassau, Osaka, Rio De Janeiro, Santiago, Sao Paolo, Seychelles, Singapore, Sydney and Tokyo. c) For all travel in Club World on the following routes, a Sunday night stay is required – London Heathrow to Amman, Beirut, Bengaluru, Chennai, Delhi, Hyderabad, Mumbai and Tel Aviv. d) For all travel in Club World on the following routes, a three night minimum stay is required – London Heathrow to Abu Dhabi, Bahrain and Dubai. e) For all travel in Club World on the following routes, a five night minimum stay is required – London Heathrow to Beijing, Hong Kong, Seoul and Shanghai. f) For all travel in Club World on the following routes– London Heathrow to Nashville, New York, Vancouver, a three night minimum stay is required from 24 November 2019 to 02 January 2020, and a Saturday night stay is required from 03 January to 03 April 2020.
g) For all travel in Club World on the following routes, a Saturday night stay is required – London Gatwick to Cancun, Fort Lauderdale, Lima, Mauritius, Orlando and Tampa. h) For all travel in Club Europe on the following routes, a Saturday night stay is required – London Heathrow to Amsterdam, Berlin, Bucharest, Stockholm, Athens, Barcelona, Belfast, Billund, Bologna, Brussels, Basel, Budapest, Paris, Copenhagen, Dublin, Dusseldorf, Edinburgh, Faro, Rome, Frankfurt, Gibraltar, Glasgow, Gothenburg, Geneva, Hanover, Hamburg, Helsinki, Ibiza, Inverness, Kiev, Keflavik, Krakow, Leeds/Bradford, Larnaca, st Petersburg, Lisbon, Luxembourg, Lyon, Malaga, Madrid, Manchester, Marseille, Munich, Nice, Newcastle, Nantes, Oslo, Palma, Prague, Pisa, Sofia, Stuttgart, Toulouse, Valencia, Vienna, Warsaw and Zurich. i) For all travel in Club Europe on the following routes, a minimum stay of 2 nights is required. – London Gatwick to Almeria, Amsterdam, Bilbao, Bordeaux, Cagliari, Jersey, Malaga, Nice, Venice and Verona. ii) For all travel in Club Europe on the following routes a Saturday night is required. – London City to Amsterdam, Berlin, Dublin, Dusseldorf, Frankfurt, Geneva, Munich, Paris Orly, and Zurich. a) For all travel in First on the following routes, an advance purchase of 7 days is required: London Heathrow to Doha. b) For all travel in First on the following routes, an advance purchase of 14 days is required: London Heathrow to Tokyo. c) For all travel in First on the following routes an advance purchase of 28 days is required: London Heathrow to Santiago and Sao Paolo. d) For all travel in Club World on the following routes, an advance purchase of 7 days is required: London Heathrow to Bangkok, Doha, and Singapore. e) For all travel in Club World on the following routes, an advance purchase of 14 days is required: London Heathrow to Abu Dhabi, Bahrain, Beijing, Beirut, Bengaluru, Cape Town, Chennai, Delhi, Dubai, Durban, Hong Kong, Hyderabad, Johannesburg, Mumbai, Nairobi, Osaka, Seoul, Seychelles, Shanghai, Tel Aviv and Tokyo. h) For all travel in Club World on the following routes, an advance purchase of 28 days is required: London Heathrow to Amman, Buenos Aires, Grand Cayman, Nassau, Rio De Janeiro, Santiago and Sao Paolo. i) For all travel in Club World on the following routes, an advance purchase of 50 days is required – London Heathrow to Nashville, New York and Vancouver. j) For all travel in Club World on the following routes, an advance purchase of 14 days is required: London Gatwick to Cancun, Fort Lauderdale, Lima, Mauritius, Orlando and Tampa. k) For all travel In Club Europe on the following routes an advance purchase of 14 days is required : London Heathrow to Amsterdam, Berlin, Bucharest, Stockholm, Athens, Barcelona, Belfast, Billund, Bologna, Brussels, Basel, Budapest, Paris, Copenhagen, Dublin, Dusseldorf, Edinburgh, Faro, Rome, Frankfurt, Gibraltar, Glasgow, Gothenburg, Geneva, Hanover, Hamburg, Helsinki, Ibiza, Inverness, Kiev, Keflavik, Krakow, Leeds/Bradford, Larnaca, St Petersburg, Lisbon, Luxembourg, Lyon, Malaga, Madrid, Manchester, Marseille, Munich, Nice, Newcastle, Nantes, Oslo, Palma, Prague, Pisa, Sofia, Stuttgart, Toulouse, Valencia, Vienna, Warsaw and Zurich. The promotion applies only to flights on the routes specified on ba.com. These are operated by BA except where shown to be operated by Qatar, Japan Airlines, Iberia or American Airlines. The promotion does not apply to travel on any other BA franchisee or alliance airline, or any flight operated by a codeshare partner. All promotional flights are non-refundable and non changeable. Promotional travel must be booked, ticketed, started and finished in the UK. Promotion does not apply to group bookings (10 or more passengers in one booking). Regional connections to London Heathrow, London Gatwick and London City airports for travel to onward long haul destinations are excluded from this promotion, and vary in cost depending on the regional airport. Payment must be made in full at the time of booking. If booking direct with BA via telephone on 0844 493 0775 or online at ba.com, payment by cheque will not be accepted. Bookings made over the telephone will carry a non-refundable £10 offline booking fee per person per ticket. Calls cost up to 5p per minute from a BT landline. Calls from mobiles may vary. Please note that some credit card issuers will not permit payment for air travel from the UK to be paid for on credit cards that they have issued if the billing address is outside the UK. BA does not accept responsibility for the refusal of any card issuer to allow use of its cards for payment. Prices are based on debit card payments. BA applies a charge for some other payment methods, including corporate credit cards. All travel on BA flights is subject to BA’s General Conditions of Carriage for Passengers and Baggage (see ba.com) and the notice and conditions of contract contained on each ticket and itinerary. Travel on services operated by Qatar, Japan Airlines, Iberia, American Airlines or any other partner carriers are subject to the conditions of carriage of the relevant carrier. This promotion, and any non-contractual obligations arising out of or in connection with it, is governed by English law and is subject to the exclusive jurisdiction of the English Courts. Flight prices are updated every 24 hours and are accurate when published and may vary upon reaching subsequent page.